My Star-Wars-is-a-banquet-come-as-you-please change of heart actually reveals my own hypocrisy. It’s called (and this term I hereby coin) Warp Speed Hypocrisy. Campfire scene from Star Trek V: The Final Frontier. 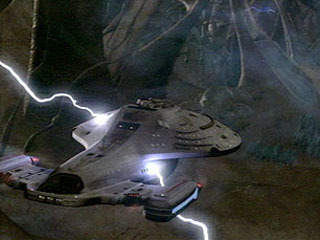 I’ve been disappointed many times, but less-than-awesome Trek never made me angry like the Star Wars prequels did. And I don’t see much polarization in general Trek fandom. Red-faced redshirts don’t seem to be cursing the new movies or a series they don’t prefer. It’s because trekkies and trekkers already see Trek as a banquet. So why did/do I hold Star Wars to masterpiece standards? I’ll try to unravel this with my brilliant summation in the upcoming final post! At the massive Salt Lake Comic Con of 2013, I led a panel discussion in huge, packed room. The topic? The Abrams-ization of Star Trek and Star Wars. What resulted was a spirited debate on old Trek vs. new Trek and classic Star Wars vs. the prequels vs. the specter of the upcoming Abrams films. And there I crossed lightsabers with Bryan Young. (Author James Wymore was also there. He loves ANYTHING with spaceships!) At that time, I was stunned, shocked even, at Bryan’s defense of and even love for the prequels. I also asked the audience what their favorite Star Wars movie was. The originals won out by a show of hands, but many people voted for the prequels, with a special emphasis on Revenge of the Sith. Our last distinguished guest is a bonafide expert on Star Wars and Star Wars culture. Bryan Young is a writer and a journalist. He has a regular column on StarWars.Com and is the editor-in-chief of the nerd news and review site Big Shiny Robot! He’s published three novels, with a fourth scheduled for release later this year. Are there some sort of basic “categories” or “types” of Star Wars fans”? If so, what are they? I think there are really two types of fans. The vocal minority who only love the classic trilogy before 1997 and everyone else. And that’s really it. Beyond that you’ll get people who specialize in different things, but there’s a unifying factor: everyone who calls themselves a Star Wars fan loves Star Wars, so even if we have varying degrees of love for different aspects of the universe, we all have some things we can agree on. Why do you think there is friction between fans who dislike the prequels and fans who like them? How are the upcoming J.J. Abrams films entering into the debate? Me and a groovily awesome Star Wars fan at Dragon*Con one year. I think the friction comes from an attitude of entitlement on the vocal few who dislike the prequels. They fail to realize that there are far more people who love them than don’t and I would count myself among those who do love them. The friction comes from a place of disrespect, really. I can respect you if you don’t like the prequels, but in my experience there are very few fans who dislike the prequels that will offer that same respect to someone who does. It’s unfortunate that there isn’t more love for the prequels since they really are such beautiful films that add to the tapestry of Star Wars mythology in very stunning ways. But there’s only a narrow generational band of fans that have that anti-prequel bias and twenty years from now it won’t be an issue and I can’t wait for that day to come. As far as JJ Abrams films entering into the debate, I’m not sure there’s much of a debate. The prequels ARE. And so too will these new movies be. We can accept them as part of the buffet of Star Wars or not, but you don’t stick your fingers in the mashed potatoes at the buffet table because you didn’t like them. My hope for these movies is that they do much of what Star Wars: Rebels has done, stitch together the fans of the classic trilogy and the prequel trilogy and give us the best of everything Star Wars has to offer. What is Star Wars “canon” and how has it changed over the years? What is/are the Star Wars “Legends”? Another pic I snapped at Dragon*Con. 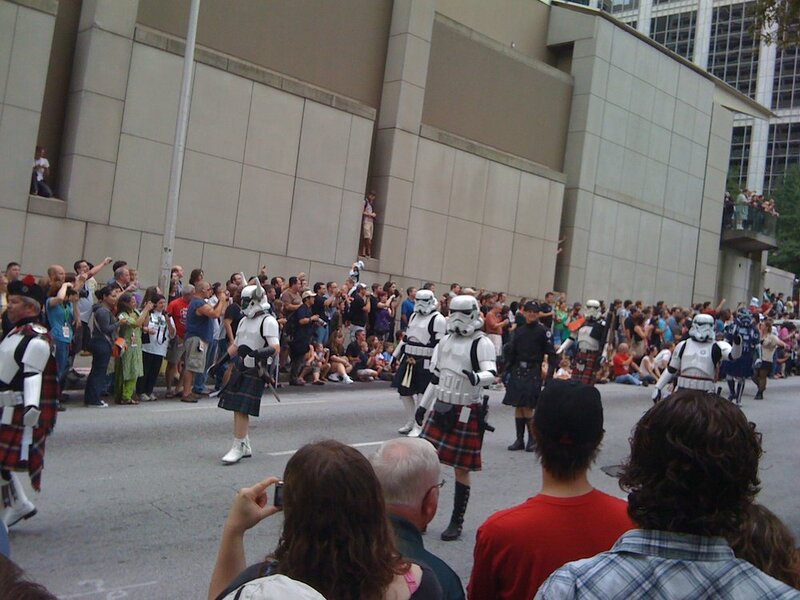 How’s this for Expanded Universe… Star Wars Bagpipe Brigade! “Legends” is what they decided to make the Expanded Universe. For many, the stories in that expanded universe WERE the canon, but the Legends designation clearly delineates them from the official canon. And now, everything taken in tandem, shows, books, movies, comics, will be part of THE canon. So you’ll start to see books with the “Legends” banner, and those are interesting stories, often well told, that occur in a version of the “Star Wars” universe, though not concurrent with the one we’ll be seeing unfold in future movies. How do “Legends” and the “Expanded Universe” affect Star Wars fandom? How do they affect your viewing of the movies? Well, they affect the fandom in ways that are sometimes polarizing, because there are some who think that future installments should be slaves to the books and the previous definitions of canon and others (like myself) who believe that the new Legends designation will free the filmmakers up to tell the best Star Wars stories possible. As for how they affect me, I’m a fan of the films first and the rest of the stories second, so as long as they serve to heighten my understanding and enjoyment of the films and the overall tapestry of Star Wars myth, then I am very happy and well served. May 23, 1994 – a cheer erupted from a house packed with nerdy (and not-so-nerdy) high schoolers as the Riker-commanded three-nacelled Enterprise unapologetically demolished a Klingon bird of prey. 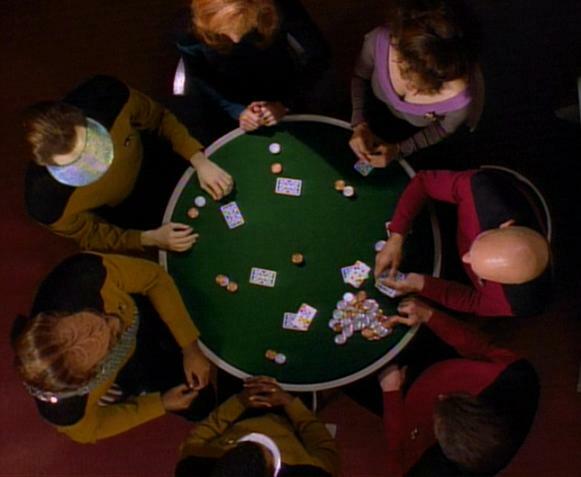 Star Trek: The Next Generation was about to end. What was next? Shortly after, my brother secured a bootleg copy of the Star Trek: Generations movie script, and as TNG went to the big screen, I knew the heady days weren’t over. On November 19th, 1994, (shamefully missing the premiere by 1 day) I shivered with glee as I sat down next to my patient girlfriend and watched Kirk and Picard save the galaxy together. 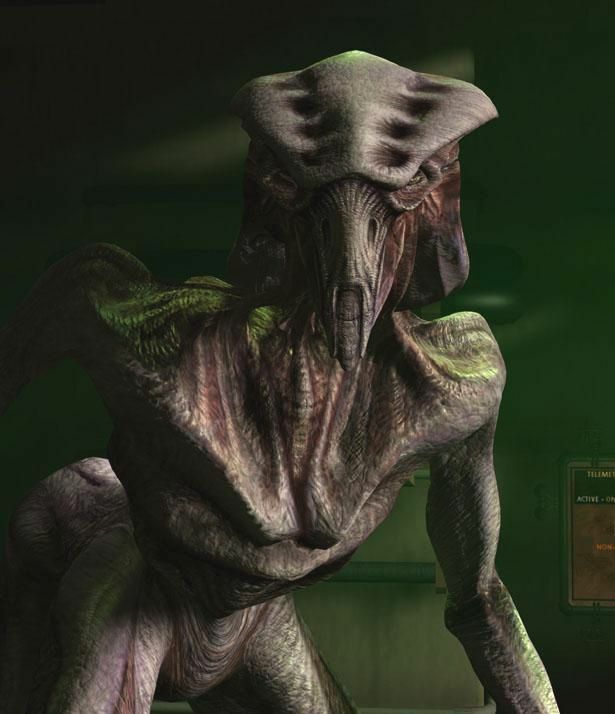 Obviously, Kes was originally part of the crew, and Seven came in in season 4. Only two months later, something called Star Trek: Voyager came along. A female captain? What’s this? A funky new ship design? Not even a homage to Alexander Courage in the intro music? 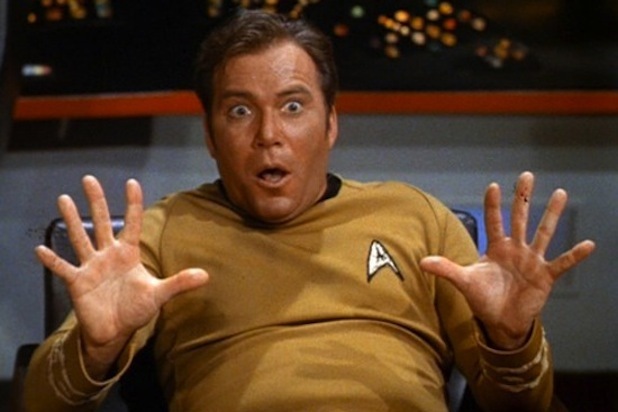 And most shocking, no “Space the final frontier…” intro monologue? 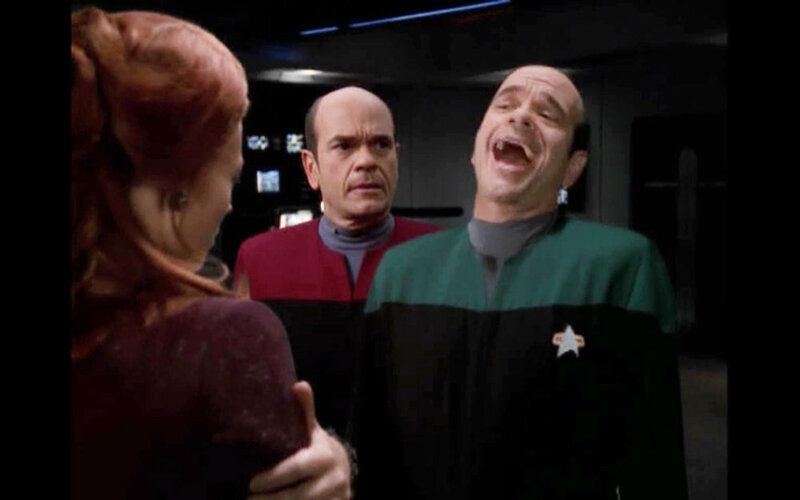 College, missionary work, poverty, dating, and cleaning toilets to buy ramen and cereal were worthy/necessary distractions from Voyager—but the fact was the series just didn’t grab me. Every time I was on the Enterprise—Constitution, Galaxy, and Sovereign, I felt at home. As a young man, not even Seven of Nine could keep me aboard the fancy Intrepid-class bio-circuited flying machine in the delta quadrant. 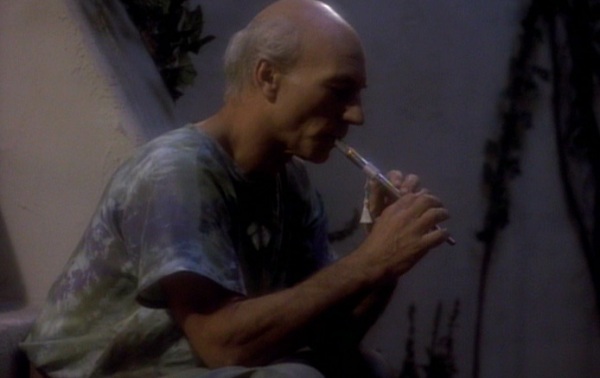 For me, what was missing was that magical something in the relationships of Kirk’s and Picard’s crews. I diss no one here… I know many felt that even more with Voyager and DS9. But it didn’t click for me. Years passed and I found myself searching for some sci-fi company in lonely moments. I tried a variety, but my heart longed for the steady pulse of a warp engine. So, over the last few months, I have been watching tons of Voyager. And, well, I was amazed. I didn’t find the ten-forward camaraderie I had longed for, but I did find some fabulous science fiction. Beyond visionary things like tricorders and communicators, I don’t think Star Trek in general gets the sci-fi props it deserves—and that is especially true of Voyager. Episode after episode—well-acted and produced with many notably great moments—seized upon very cool sci-fi concepts. As a writer and a producer with an actress wife, I feel like I can appreciate the achievement of producing and performing in an incredible 172 episodes of such an ambitious show. This is touched on by Shatner’s great documentary The Captains. But what struck me was the science fiction. I had a fun, funny, and hopefully slightly mind-expanding chat with my oldest kids after watching one of the original Kirk episodes just the other night—discussing the spiritual aspects of some of the sci-fi ideas. But in so many shows today, the “sci-fi” is just marketable window dressing. 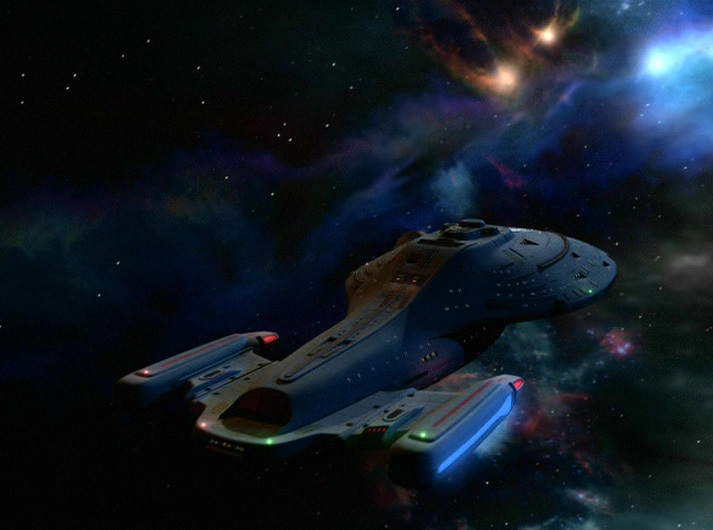 Voyager was surprising, refreshing, and deliberately thought-provoking. In a few years, and after carefully curating for kid-friendly episodes as I do with other Trek, I’m sure I’ll introduce it to my cadets. During my revisit, I found myself staying up late many times, and enjoying not only the sci-fi, but the characters who wove it into a story. 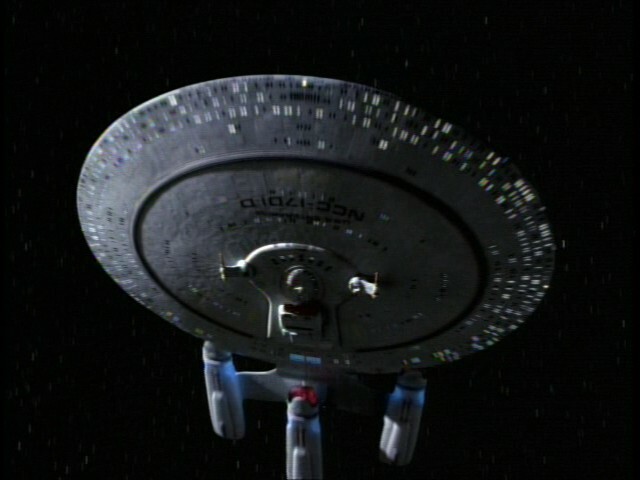 Thank you to all the folks who made Voyager happen. 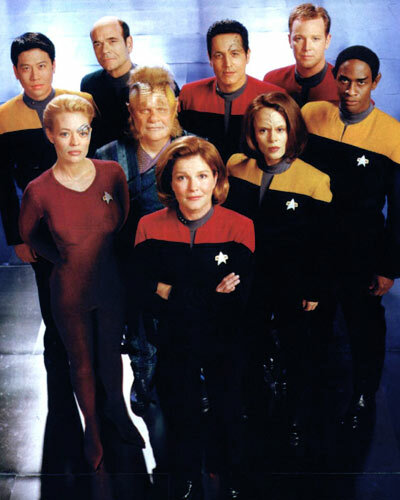 In conclusion, Star Trek: Voyager boldly went.